Our winter months are a great time for birding on the Upper Texas Coast. 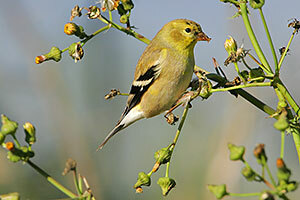 One cheerful, attractive winter visitor from the north is the American Goldfinch. While we see few of them in their bright yellow breeding plumage, their winter plumage of olive-yellow is still quite attractive. They normally travel in small flocks and attracting twenty to thirty of these colorful birds to your yard can brighten your day. Profile by Glenn Olsen: The genus name is derived from carduus, the Latin word for thistle, and the American Goldfinch is primarily an eater of seeds, especially during the winter. We have native and non-native thistles that the birds feed on. Thistles should not be confused with niger or Nyjer® seeds, which are tiny, black birdseed cultivated in Asia and Africa. However, one way people attract these beautiful birds is by placing niger or Nyjer seeds in bird feeders and the birds love them because they are high in calories and rich in oils. 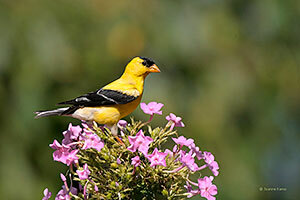 Another excellent way to attract this species as well as many other birds year round is to landscape with plants that produce seed attractive to the American Goldfinch. There are a wide variety of plants to choose from, including flowers, shrubs, vines, and trees. Here are a few: thistles, dandelions, sunflowers, goldenrod, evening primrose, native asters, St. Johnswort (Hypericum), trumpet creeper, and certain grasses. Any of these can be planted in existing flower beds to add additional color. The seeds of elm, sweet gum and sycamore trees are also eaten by the American Goldfinch. So incorporate a few of these plants into your landscaping and begin to provide food and habitat for the American Goldfinch and many other birds too.